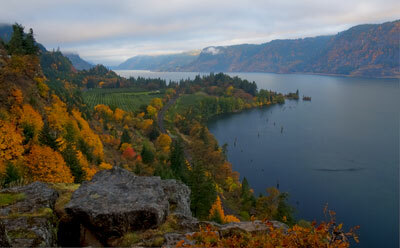 Just an hour east of Portland, Hood River lies amidst abundant orchards, wineries and gorgeous autumn views. In the fall, glimmering yellow and vibrant burnt-orange trees create a stunning contrast against deep green evergreens and the snowy peak of Mt Hood. When I was a little girl, I’d ride along with my mom and grandma on their September trip to Hood River. We would buy apples, corn, pears and peaches to take home and preserve for the rest of the year. I still remember my grandma’s delightful apple butter, made with brown sugar and maple syrup. 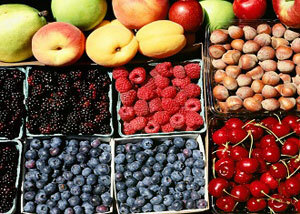 If you want to sample some of these Oregon offerings, you must tour the Hood River County Fruit Loop. This 35-mile scenic loop takes you through the valley’s farms, orchards, forests and friendly towns. If you’re planning a getaway during peak fall foliage season in October, consider adding the Honeycrisp Harvest at Kiyokawa Family Orchards, the Hood River Valley 29th Annual Harvest Fest, the Gorge Fruit and Craft Fair at the Hood River County Fairgrounds or the Hood River County Fruit Loop Heirloom Apple Celebration to your itinerary. Hood River also boasts more than 20 local wineries. Visit the Gorge White House, a working farm listed on the National Registry of Historic Places, to sample vintages from more than 30 regional wineries. While you’re so close to Multnomah Falls, you should definitely take this opportunity to get up-close-and-personal with this awe-inspiring, breathtakingly powerful cascade of rushing water. A five-minute walk from the parking lot takes you to the base of the falls. Don’t forget to check out the historic lodge while you’re there. Whether your attraction is the fruit, foliage, wine or waterfalls, this area is a must-see in the fall. Learn more about the Mt Hood/Columbia River Gorge region. This entry was posted in Favorite Fall Trips, Mt. Hood/Columbia River Gorge, Trips and Tours and tagged Hood River, Hood River County Fruit Loop, Multnomah Falls, Oregon Bounty, wine by Travel Lane County. Bookmark the permalink.